Whispers in the Loggia: Papa Ratzi's "Thanksgiving" – On His Priestly 65th, B16 Seeks "The Transubstantiation of the World"
Forty months into an unprecedented experience in the modern life of the church, this morning saw another of those moments that still feels a bit surreal: two men in white in the Sala Clementina of the Apostolic Palace, as the Pope led a Vatican celebration (fullvid) marking his predecessor's 65th anniversary of priesthood. Having referred to his ordination day in his 1997 memoir as "the high point of my life," the figure who'd become Benedict XVI was praised by the reigning pontiff for a "whole life spent in priestly service and true theology that" Joseph Ratzinger had "not accidentally described as 'the search for the Beloved.'" Amid the first papal retirement since the 13th century – and a far more peaceful one than prior attempts at it – Francis underscored to his predecessor that "you, Holiness, continue to serve the church, [you] do not cease to truly contribute with vigor and wisdom to her growth," adding that Benedict's "hidden" life in a converted Vatican convent "reveals itself to be altogether something other than one of those forgotten corners in which the disposable culture of today tends to relegate individuals when, with age, their strength fails." For his part, meanwhile, Papa Ratzinger closed the gathering by offering an unscripted word, marking the first public talk he's given since leaving Peter's chair on 28 February 2013, when Benedict told the waiting crowd at Castel Gandolfo that – whatever his secretary may have to say about it these days – "I'm no longer the Pope; now I'm just a pilgrim, beginning the last part of his journey on Earth." 65 years ago, a brother ordained with me decided to inscribe on the prayer card of his first Mass just one thing: leaving out his name and the date, one word, in Greek, "Eucharistomen," convinced that with that word, in all its many dimensions, already said everything one could in that moment. "Eucharistomen" speaks of a human thanks, thanks to all. Thanks above all to you, Holy Father! Your goodness, from the first moment of your election, in each moment of my life here, moves me, it really carries me interiorly. More than in the Vatican Gardens, with their beauty, your goodness as the place where I live: I feel protected. Thank you, too, for the word of appreciation, for everything. And we hope that you will carry us all forward on this way of Divine Mercy, showing the way of Jesus, toward Jesus, towards God. Thanks as well to you, Eminence [Cardinal Sodano], for your words which have truly touched my heart: "Cor ad cor loquitur." You have made the hour of my priestly ordination present again, as well as my 2006 visit to Friesing, where I relived it. I can only say that, with these words, you have interpreted the essentials of my vision of the priesthood, of my work. I'm grateful for the bond of friendship that has stretched over all this time, even now roof to roof: it's so present and tangible. 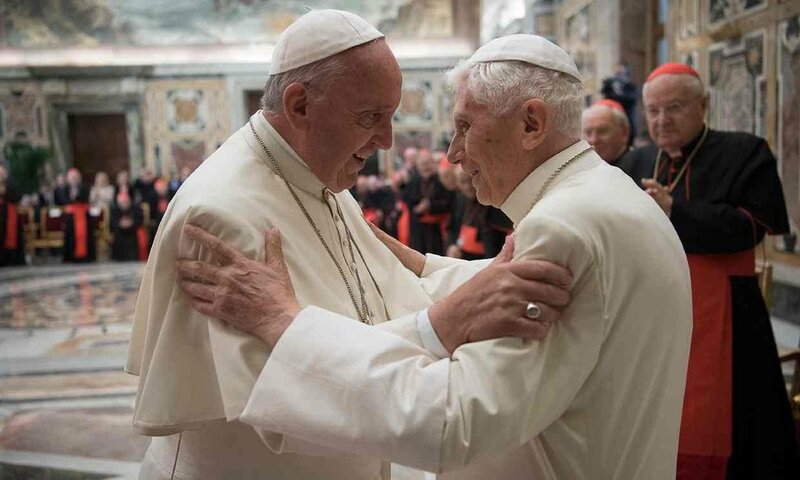 Thank you, Cardinal Muller, for the work you did on presenting my texts on the priesthood, in which I also seek to help our brothers to enter ever more into the mystery which the Lord himself puts into our hands. "Eucharistomen": in that moment, my friend Berger sought to emphasize not only the dimension of human gratitude, but naturally the more profound word hidden within it, which appears in the Liturgy, in Scripture, in the words "gratias agens benedixit fregit deditque" ["giving You thanks, blessed and broke it, saying..."]. "Eucharistomen" recalls that reality of gratitude, that new dimension which Christ has given us. He has transformed in gratitude, and so in blessing, the cross, suffering, all the evil of the world. And so he has fundamentally transubstantiated life and the world and has given us and gives us each day the Bread of true life, which conquers the world through the strength of His love. In the end, let us place ourselves in this "thanks" of the Lord, so to really receive newness of life and help for this transubstantiation of the world: that there may be a world not of death, but of life; a world in which love has conquered death. Thanks to all of you. May the Lord bless you all.